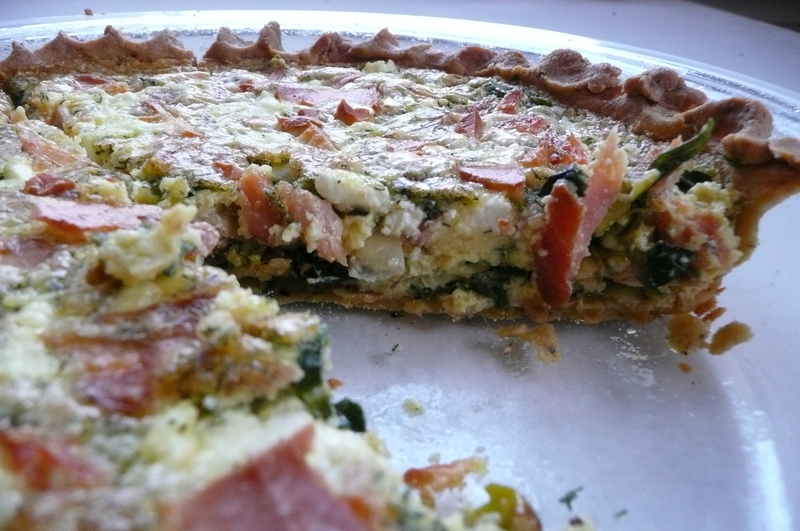 Really good quiche should be creamy and moist, much less solid than standard scrambled eggs or frittata. The secrets are: cream and air. 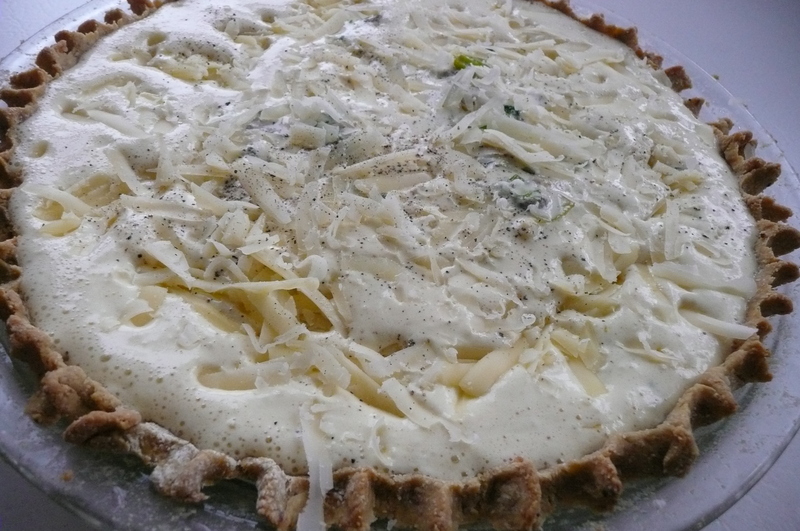 To make a creamy quiche filling that will fit in the crust of a standard sized pie plate, you only need two eggs, or three if it’s a really deep dish. I was surprised by this, but Julia Child taught me (indirectly, of course) about quiche fillings, and I’ve always subscribed to a fairly orthodox W.W.J.D. philosophy: What Would Julia Do? 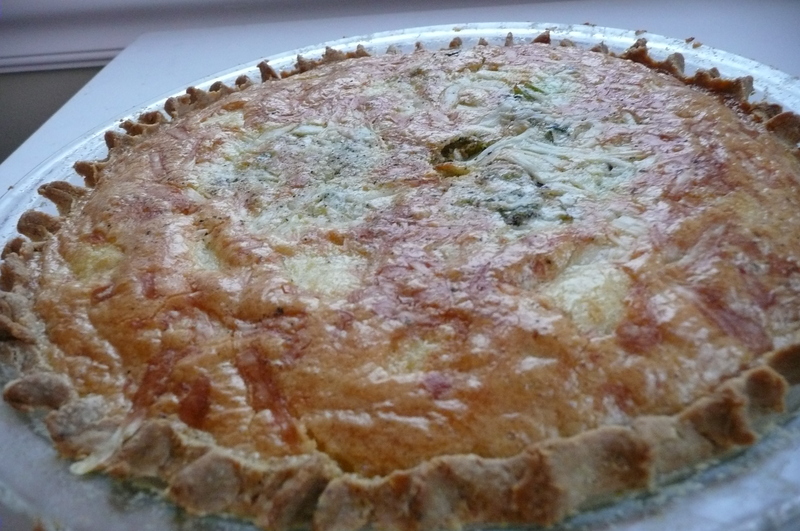 Quiche is pretty simple to make. The crust for this recipe is time consuming, but worth it. 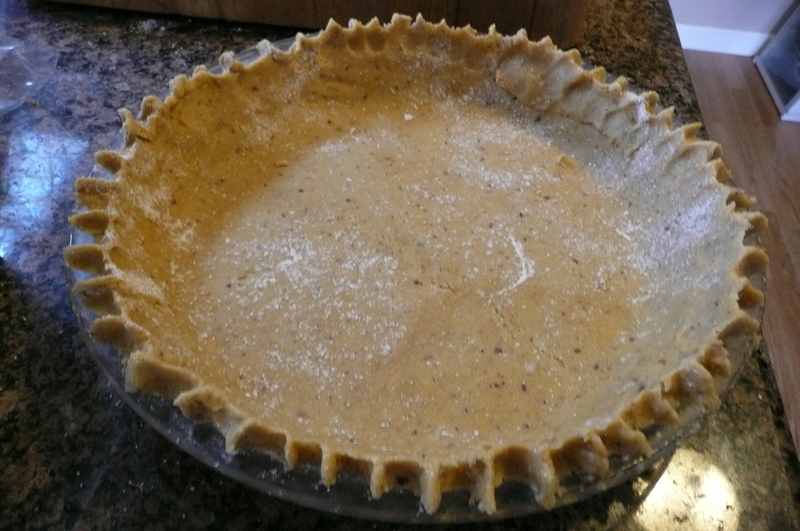 It’s full of eggs, butter and hazelnut meal, and lower in grains than a standard flour crust, glutenous or otherwise. You can use any sort of pie dough, brioche dough, or gluten-free dough for a quiche crust, or you can leave the crust off entirely if you prefer to limit your grain intake for nutritional reasons. Note, though, that you should increase the amount of filling if you leave off the crust, or consider baking the filling in small ramekins instead. I filled this quiche with wild mushrooms and leeks because both are available in season, and because they’re a fantastic combination. 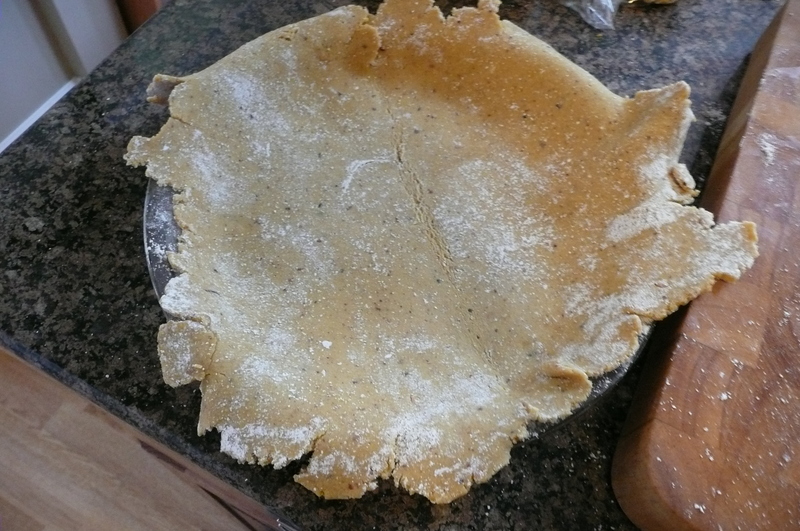 Makes TWO bottom crusts; you can freeze half the dough for next time. 1. In a bowl, barely mix yeast, warm milk, half a cup of the first flour, and the first small, beaten egg. Sprinkle the other quarter cup of flour on top, and set somewhere warm for 30-40 minutes. 2. Add the sugar or honey, salt, other eggs, and half a cup of the next batch of flour. Combine on low in an upright mixer. Sprinkle in the hazelnut meal and increase the speed, stopping to scrape the sides as needed. Add in the remainder of the flour with the pectin and optional arrowroot and beat for another three minutes. 3. To add the butter, you want to make it smooth first. Place it between two pieces of parchment paper or plastic and beat it senseless with a rolling pin for a few seconds, and it should work well. 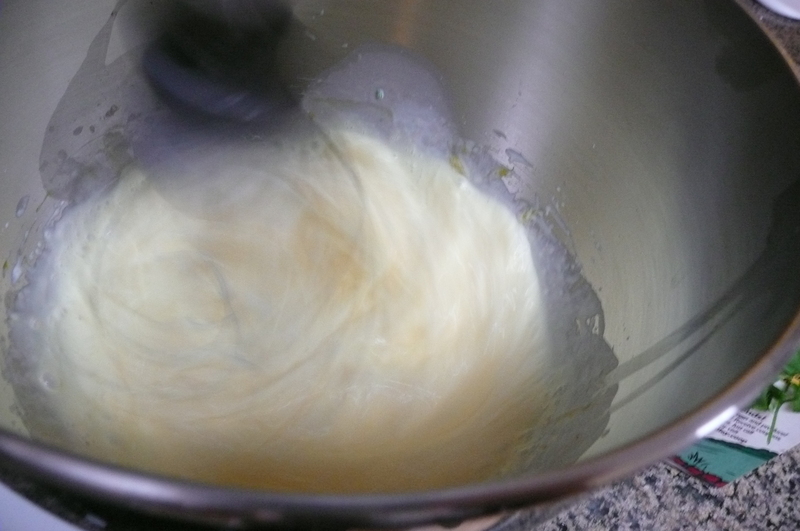 Add the butter one bit at a time to your mixer, while continuing to beat on medium, until all the butter is incorporated. 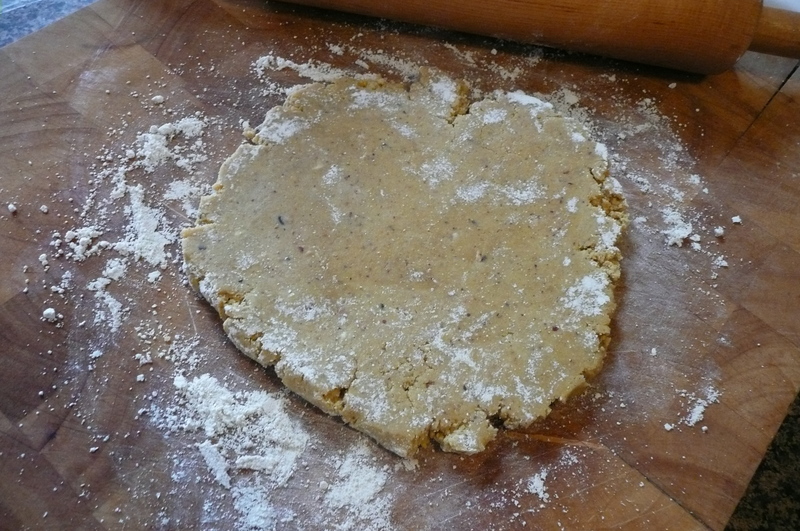 If your dough still looks quite wet, add a little more flour and/or hazelnut meal. 4. 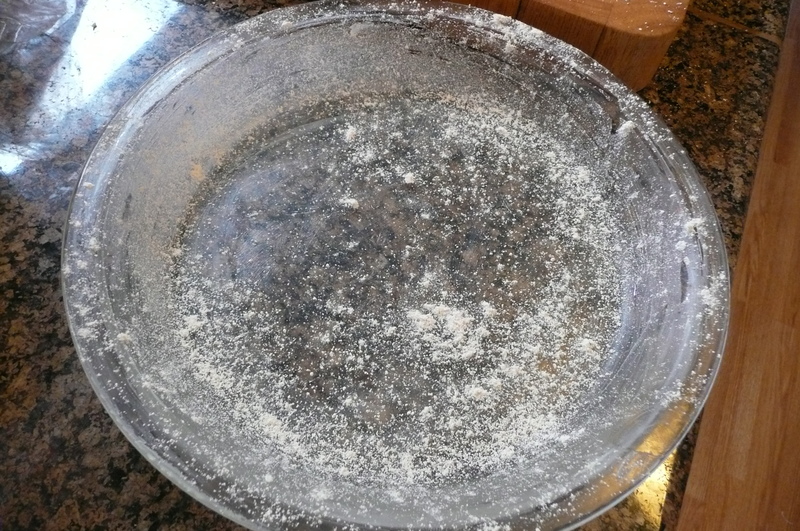 Transfer to a buttered or oiled bowl, cover with a damp cloth, and let it rise somewhere warm for about 1.5 to 2 hours. 5. Flip the dough over with your fingers and poke it to deflate it. You can also freeze it, or freeze half the batch, at this point. Cover with a damp cloth and let the dough rise again at room temperature for half an hour, then cover with plastic and transfer to the refrigerator, where you’ll let it sit for 4-6 hours or overnight. 6. 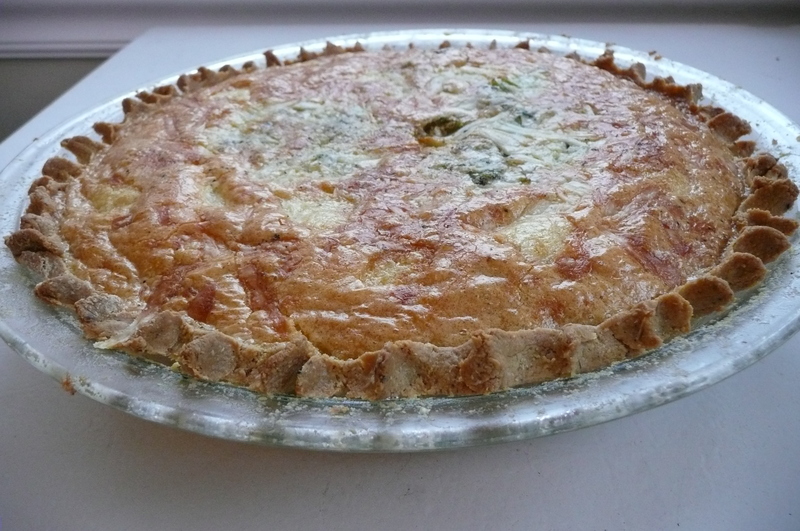 When you’re ready to make your quiche, butter and dust with flour a pie dish and set aside. Preheat oven to 375F. 7. Dust your cutting board with oat or rice or potato flour. Dust your rolling pin. Set aside some flour to continue this. 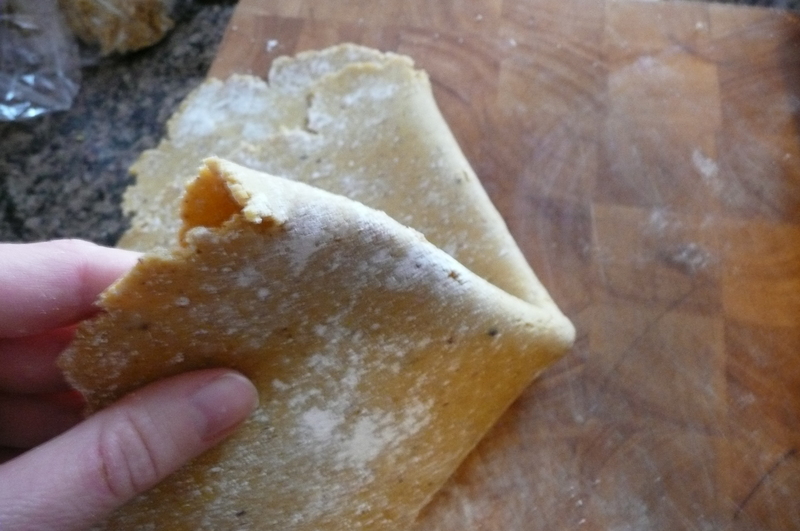 Take half your batch of dough and press into a flattened lump. 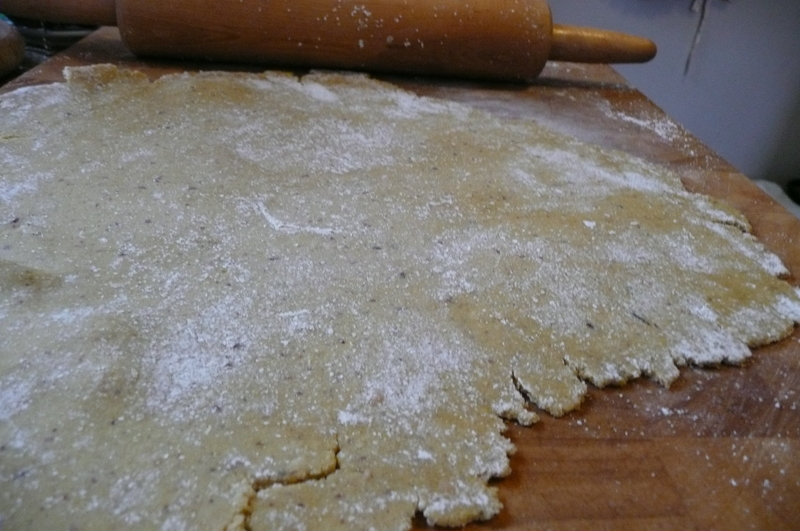 Use your rolling pin to roll out from the center of the lump toward the edges. 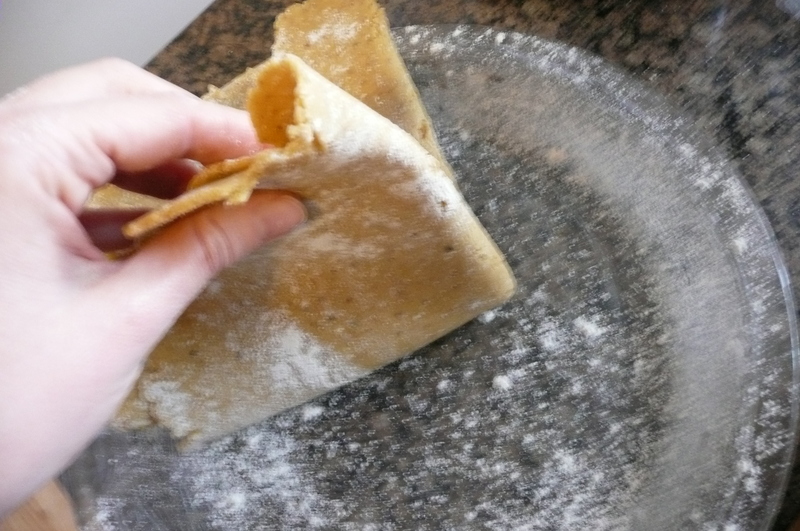 Every few rolls, pick up your dough, dust it with flour gently (and dust the board and rolling pin) and flip it. Do this until you have a circle of dough about 1/4 inch thick at most. Gently fold the circle in half and then half again, just loosely enough to list it. Engage the help of a friendly spatula if you’re worried about it tearing. Place the folded dough in the pie pan and unfold it. Arrange into place, trimming excess corners, and pinching the edges if you want it to look pretty. Poke a few times with a fork to keep it form inflating. 8. Bake at 375F for 15 minutes or until it’s lightly golden. Take out and set aside. 1. 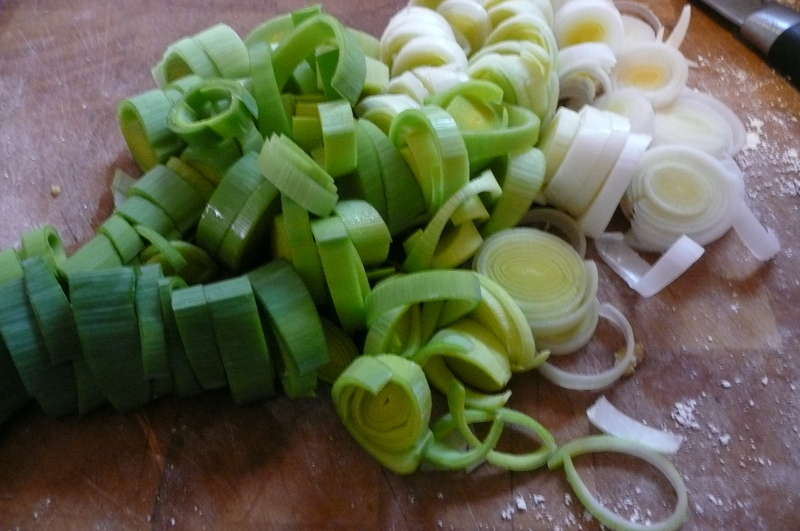 Trim ends of leeks, remove any really thick green parts (usually 1-2 layers) and wash well. Slice thin into rounds. Chop wild mushrooms into small pieces. Use any variety. Hedgehogs are in season. This quiche would be amazing with morels. 2. Heat butter in a pan. When melted, add leeks and stir. Keep adding butter as they absorb it, and toss in a pinch of salt. 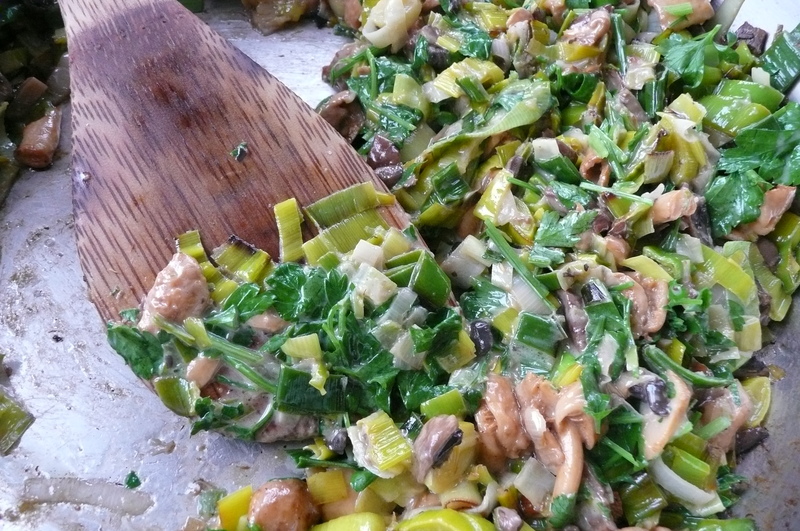 When the leeks are completely wilted and a few are slightly browned, add your mushrooms and a little more butter. Stir until mushrooms release liquid or smell strongly of their cooked flavor. At this point, add a dash of cream and let the leeks and mushrooms absorb it. Add the parsley or greens, finely chopped, and stir one minute more. Turn off heat and set aside. 3. In a stand up mixer or by hand, whisk together eggs and cream. You want them to get very light and fluffy. Whisk in salt and nutmeg. 4. Add leek mixture into eggs and stir. 5. Pour into crust. Sprinkle some of the cheese about halfway, and reserve most of it to sprinkle on top. Grate on a little black pepper and dab the butter on in little bits. 5. Bake at 375F for 25-30 minutes. Top should be golden and a knife should come out clean.